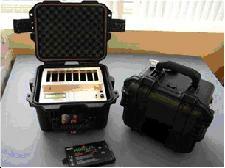 The Power8 Battery Box is a safe, portable, rechargeable Lithium Ion power solutionfor a wide range of remote devices. The flexible 584 Watt Hour design enable users the choice of various Regulated DC output voltages such as Power Over Ethernet (POE), 19V, 24V, 28V or 48V. Systems are used at sea or in the field to power devices or equipment that need extended off grid power for sensors, communication equipment, notebook computers or anything that can run off DC power. Users are never left in the dark with a real-time LCD display providing critical power data such as total capacity, charge state and runtime to empty. ~ Portable Size: 11.8" x 9.8" x 7.7"
*Users should check with Battery Pack manufacturer for specific data. The Power8 Battery Box microprocessor continuously communicates with the attached Smart battery packs in the system, managing charging and discharging, and responding to any key events. Energy density is maximize by using up to eight 73 Watt Hour battery packs clustered together to provide up to 584 Watt Hours of total battery capacity. Typical Applications: Supplying clean, lightweight, safe and space-saving portable power to the field Sensors, Instrumentation, Marine (ROVs, AUVs Equipment), Military, Ruggedized PC, and Telecommunications Equipment Segments. LCD Display - A very low-power 16x2 character LCD display is available to allow for visual monitoring of the Power8 battery system status.